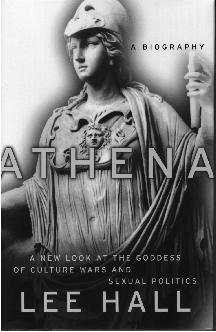 A fascinating read simply on the level of storytelling, Athena draws upon rich traditions in ancient history and classical literature to meld the hypothetical "life" of Athena into a single chronological narrative, tracing the parallel unfolding of the goddess's story with the emergence of the Greek mind. A spirited if sometimes familiar retelling of Athena myth and lore that unveils the goddess as a complex, changing personality and object of worship. Hall, former president of the Rhode Island School of Design and author of a biography of the de Koonings (Elaine and Bill: Portrait of a Marriage, 1993), is not a classical scholar, and her book seems aimed more at a popular than scholarly audience. The opening chapter on Athena's prehistoric origins offers an account of the evolution of religion from hunting ritual and embraces too easily the pleasing story of the ancient Great-Goddess-worshiping matriarchies. The bulk of the book, however, consists of Hall's vivid retellings of the Athena myth. While not eclipsing Robert Graves or Edith Hamilton, Hall does contribute her own novelistic flair, as when Zeus wakes up "from a snooze" to give birth to his daughter, who is pounding "the inside of the expectant father's cranium." More important, by focusing on Athena, the author transforms the goddess from a supporting character to the star she once was. In some cases, the method falters: The retelling of Homer's familiar epics gets tiresome. But many stories come off as both fresh and revealing, whether they concern Athena directly or indirectly (for example, how Hera's breast spewed out the Milky Way). Given the welter of contradictory myths, the "biographical" approach is at best a conceit: Athena's evolution from crafty, vengeful warrior to emblem of wisdom and justice makes sense not as an account of an individual's development but as a reflection of the changing times in which her worshipers lived. However, Hall succeeds in making those connections clear, right up through the religious practices of classical Athens and Athena's incorporation into Neoplatonic doctrine. Bringing out a full-bodied Athena, Hall leaves one wanting to reread the ancients and think again about the gods.